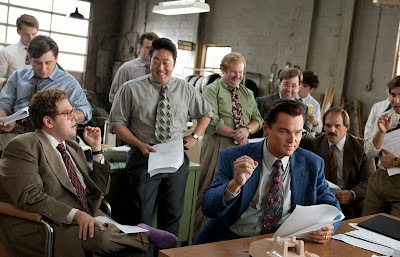 The Wolf of Wall Street starts with an ad for Stratton Oakmont; the commercial makes us believe the brokerage firm is a golden American institution, a rock of financial stability, as traditional, trustworthy, and established as if the Mayflower passengers had etched the very name into Plymouth Rock. Cut to the nightmarish circus of a rollicking party on the trading floor of the company—not unlike what we’ve imagined went on in Rome before the fall (all but the roller-skating chimp and snorting coke off hookers, of course)—and then freeze-frame on the billionaire brokers tossing a dwarf at a huge velcro target, literally and figuratively abusing the Little Guy. Stratton Oakmont is America, its founder proudly proclaims in the ad. How horrifying is it to realize that he just might be right? After going unexpectedly family-friendly with 2011’s Hugo, Martin Scorsese pulls a dramatic 180 with The Wolf of Wall Street, a nonstop barrage of drug-fueled decadence adapted by Terence Winter from real-life stockbroking swindler Jordan Belfort’s memoir. The book is a distant relative of the truth, it’s been said, and the film is a distant relative of the book. A big, unruly bacchanal with a sizeable, sinister smile on its lips, the movie is a bit of a contradiction, both abashed and unashamed, spectacle and cautionary tale, ode to and indictment of dollars, depravity, and conspicuous consumption. Disturbing and exciting, exhilarating and exhausting, the endlessly entertaining film holds together by sheer virtue of its exuberant, furious filmmaking energy. Scorsese might be the best cinematic connoisseur of charismatic sociopaths, and Henry Hill or Nicky Santoro ain’t got nothing on Belfort. The Wolf of Wall Street’s brokers are avatars of an age of heedless self-indulgence and greed, gangsters with fountain pens instead of guns, slicing and dicing your bank account and putting your savings in a vise rather than your head. And, just like in the much less cynical and coked-up American Hustle, you’ll cheer the con artists on and thank them for swindling you when they’re done. 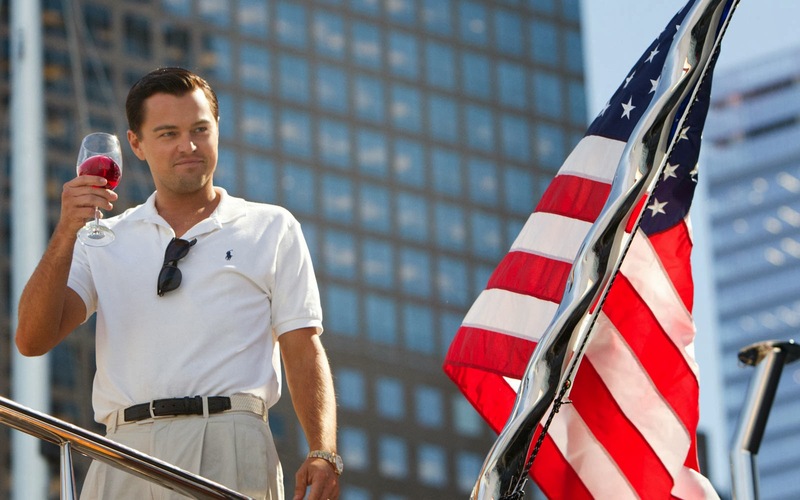 Taking its cue from (Scorsese’s own) gangster pictures, The Wolf of Wall Street shows how the working-class, Queens-raised Belfort (an all-out, mesmerizing Leonardo DiCaprio) made his way from humble origins to wealth and notoriety—and to owning a blonde, buxom trophy wife (Margot Robbie), a yacht, helicopter, and a mansion another DiCaprio character, Jay Gatsby, might find gaudy. After last year’s Django Unchained, in which he played a rich, cheerfully sadistic plantation owner, and this year’s The Great Gatsby, in which he played another self-made, shady millionaire (albeit a romantic one), DiCaprio seems to have become a stand-in for extreme capitalism, and in The Wolf of Wall Street, he achieves a near-supernatural level of superficiality. 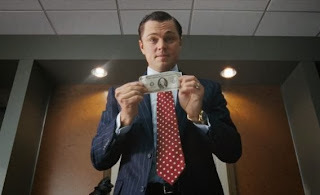 Greed is not only good, as it was to Wall Street’s Gordon Gekko, but, for Belfort, greed is also fun as hell. At first the character tries and fails to establish himself at a blue-chip brokerage firm in the late ’80s (under the tutelage of a grinning, gleeful, coked-out, humming Mephistopheles played by Matthew McConaughey) but gets laid off in the market crash. The character reinvents himself on Long Island, taking over a penny stock boiler room where he sticks out like an Armani three-piece suit on a Walmart clearance rack. It’s not long before he grows tired of “selling garbage to garbage men” and starts targeting the deep pockets of the one percent, slapping the fake blueblood name Stratton Oakmont on his own firm (started in the back room of a gas station while smoking crack), and raising its value a few thousandfold, which attracts the attention of dogged F.B.I. agent Patrick Denham (Kyle Chandler). You see, Stratton Oakmont specialized in pump and dump operations, artificially blowing up the price of nearly worthless stock and then selling it at a huge profit, thus lowering its value and causing the investors to lose their money. Like the ever-present whores at company gatherings, clients were screwed and sent on their way. DiCaprio’s Robin Hood-in-reverse assembles a team of merry men that are as far from established stockbrokers (or other representatives of corporate America) as humanly possible. Petty thugs, drug dealers, and high-school dropouts one and all, Belfort’s devoted minions are Robbie “Pinhead” Feinberg (Brian Sacca), Alden “Sea Otter” Kupferberg (Henry Zebrowski), the dreadfully toupeed Nicky “Rugrat” Koskoff (P.J. Byrne), “The Depraved Chinaman” Chester Ming (Kenneth Choi), and Brad Bodnick (Shane Bernthal), a neighborhood hothead known as the Quaalude King of Bayside. This crew might not be as dangerously violent—or concerned with codes of honor and tradition—as the filmmaker’s former cinematic male camraderies, but the familiar testosterone brotherhood is pure Scorsese. Stratton Oakmont’s enforcer is Belfort’s own galvanic, short-fused dad (Rob Reiner), who screams expletives about expenditures and debauchery even as he debates the appropriate amount of pubic hair on strippers and prostitutes—all bought and paid for with company cash. As Belfort’s right hand man Donnie Azoff —the Joe Pesci to DiCaprio’s Robert DeNiro—Jonah Hill is electrifying in the film’s most flamboyant comic performance, a buffoonish caricature of a WASP-ed up Jew decked out in garish, bleached dentures, pastel sweaters and horn-rimmed glasses. Like the uncharacteristically loose and uninhibited DiCaprio, Hill doesn’t just play the role, but inhales it, along with everything else that goes up the characters’ noses and into their blood stream. The Wolf of Wall Street plays out like the jittery, fever-pitch, paranoid last thirty minutes of Goodfellas stretched to three hours; the movie is in the thick of things, all the time, and, boy, do things happen all the damn time: stock fraud and money laundering, taping wads of cash to women’s bodies and sending them on trips to and from Switzerland to deposit the millions (which gives Jean Dujardin a lot to do with his crocodile smile), nearly crashed helicopters and nearly sunk ships, snorting off prostitutes’ backsides and blow jobs behind the wheel of a Ferrari, slow-motion Quaalude binges and sped-up coke orgies, drugged-out, frenzied montages to music, elaborate tracking shots, fast dollies and faster whip-pans. The high—or low—point of the film is a Quaalude bender that spirals into comic madness. Experiencing a delayed reaction to decades-old drugs, Belfort and Azoff skip the tingle, slur, drool, and amnesia stages and discover a whole new stage: cerebral palsy. A blubbering, freaking out Azoff stuffs his face and passes out. Belfort, almost fully paralyzed during a panicked phone call about the federal investigation and his money, crawls to his car one agonizing inch at a time, a painfully slow and hilarious race against time to stop Azoff from talking shop over a tapped phone. The sequence culminates in an epic, explosively funny battle over the kitchen telephone between two men with completely obliterated motor skills. 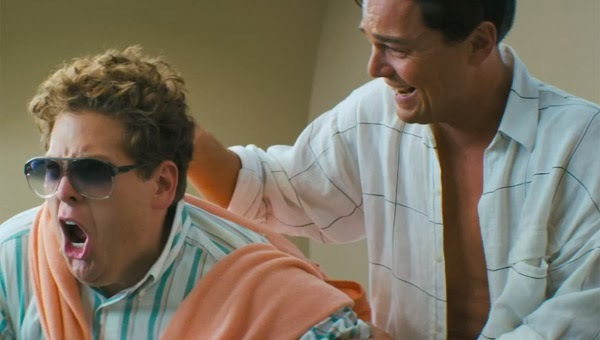 The Wolf of Wall Street is an excessive film about excess, about the compulsive appetites of loathsome men, and the director’s own appetite for his subjects and their sleazy pleasures seems bottomless. The movie is three hours long, reportedly cut down by Scorsese’s longtime collaborator, master editor Thelma Schoonmaker from four; it’s a testament to the filmmaker and the actors that we could imagine watching these cackling swine for double that time and never cease to be intrigued. It is the viewer’s choice whether to read this all as celebration or as condemnation; my feelings stray towards the latter. The film might be vulgar and voyeuristic, but it is not—as accused—amoral; Scorsese and his movie make it pretty clear that they find this behavior disgusting and the characters grotesque and degenerate. Like well-dressed animals in luxurious, lushly decorated terrariums, the characters are filmed in distorting angles, through warping lenses and often from disorienting perspectives. McConaughey’s drumming, thumping and rumble singing becomes the anthem of Belfort’s firm, and why not? The almost feral, tribal tune suggests the wild war cry of barbarians on constant, ruthless rampage. But there is a sick sense of pleasure to be gleaned from the alpha male posturing, profit-making, and howling. The film is so acerbic you almost leave with a sour taste in your mouth, a scathing satire unremittingly cynical and critical, but it’s also honest. It fascinates as much as it disgusts; by the end we’re fascinated by our own disgust and disgusted by our fascination. If there was no appeal to this kind of behavior, no one would ever engage in it; if the “good life” wasn’t alluring and the system didn’t allow for so many clear getaways, there would be no Jordan Belforts. Goodfellas, Scorsese’s finest plunge into the low life, ends on Henry Hill’s teasingly ambiguous smile. In The Wolf of Wall Street’s last moments, Scorsese turns his gaze on Belfort’s audience, suggesting it is our own greed—or at least naiveté—that feeds his. 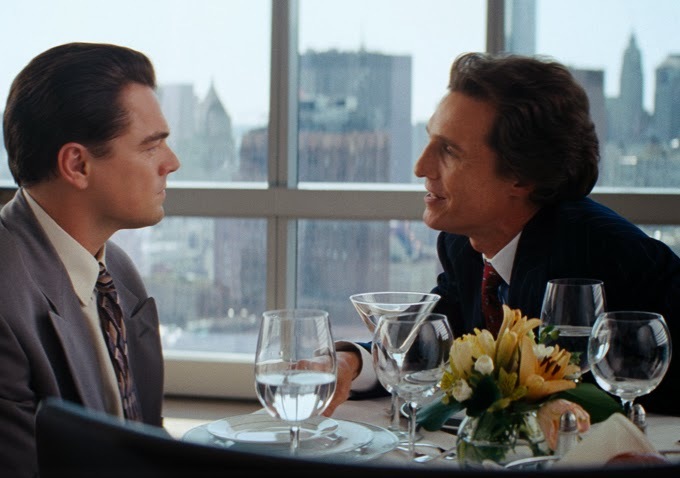 The reason guys like Belfort exist is because we, their enablers, are as addicted as they are. 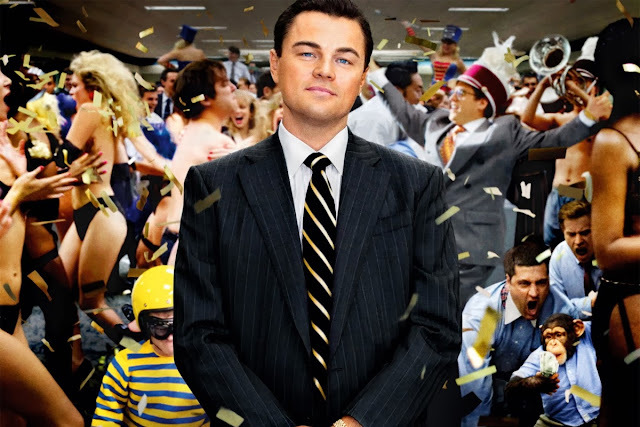 Like Belfort, we want more, more, more, never getting enough of anything, We get a contact high from following the stockbrokers, entrepreneurs, con artists, CEOs’ (or whatever they might be) exports, we egg them on and rejoice when they skirt the rules that restrict the rest of us. We turn them into disreputable folk heroes, reveling in and living vicariously through their success, letting them represent us even as they’re robbing us blind. The addiction, ours and theirs, is to the thrill of the theft, of the narrow escapes, the lies they tell, and the lives they ruin. 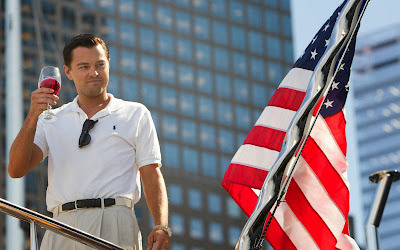 The problem is not that we might want to be like Belfort, but that we already are. Please visit The Electric Feast for more movie, music, television, technology, gaming and culture reviews.